SEE THE CHILDREN OF NANCY AND LEON PAINT BODY TOTEMS. THEY FOUND YOU TO BE AGGRESSIVE. THEY DON’T LIKE THE ACTORS. HERE IS MY HAND, HERE IS OUR HAND. HERE IS WORK, HERE IS NON-WORK. SING THE BODY, SING THE LAND. FOR AN INSTANT IT PARTS OUR HEARTS. HERE IS MY HAND IS ALEC MCINTYRE, JESHUA SCHUSTER, ARIEL CLABORN. 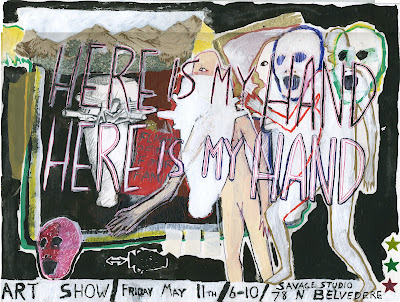 HERE IS MY HAND IS PAINTINGS.